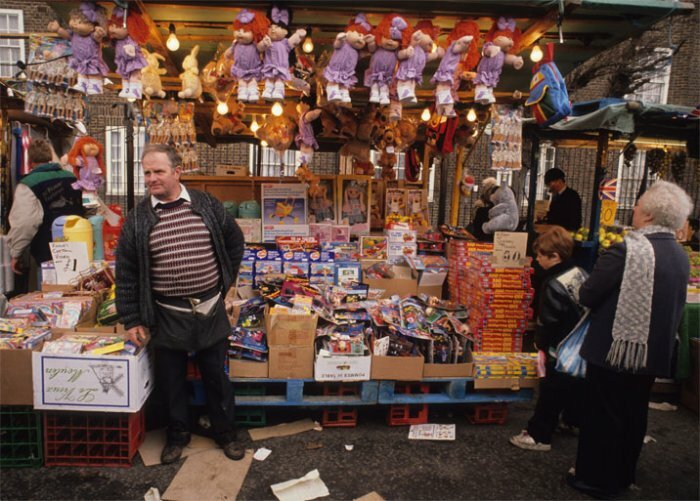 Johnny Wallington, East Street Market. Photo © David Secombe 1990. Although only officially designated a market in the 1880s, East Street Market continues a tradition of street trading in Walworth that goes back to Tudor times. Perhaps more germane to the purposes of the current post is the identification of the market with the 1980s & 90s situation comedy Only Fools and Horses, which is set in Peckham and uses photographs of East Street Market in its opening titles. The popularity of John Sullivan‘s TV series has given this stretch of south London its own place in modern popular culture. Sullivan himself was from Balham, and he knew the milieu very well. He was working as a scene shifter at the BBC when he approached producer Dennis Main Wilson with an idea for a comedy. Main Wilson was a genuine enthusiast for comedy, a quality not always found in producers of ‘light entertainment’, and had an impeccable gift for searching out the genuine article. The idea was commissioned and became Citizen Smith. Sullivan’s south London is a fabled place: Del and Rodney live in the mythical Nelson Mandela House (although there is a Nelson Mandela Way not too far away), the local boozer is a haunt of cartoon geezers and Peckham the bucolic playground for an assortment of genial chancers, through whom Sullivan has contributed several phrases to colloquial English. Television writers such as Sullivan and Galton & Simpson (Hancock’s Half Hour, Steptoe and Son) have created Dickensian characters for modern times, refashioning London in the image of their creations. Peckham has become Del Boy’s manor, just as any mention of Cheam conjures up the ghost of Anthony Aloysius St John Hancock – and Surbiton still bears the scars of The Good Life.